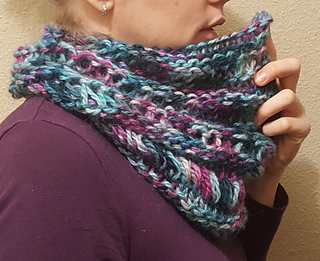 This seamless moebius cowl is a creative way to show off a few fun techniques in a quick project that makes a great gift! 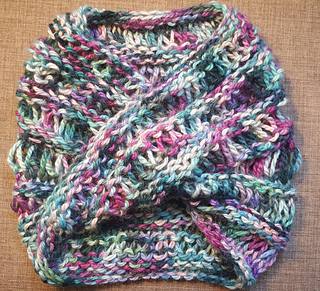 It is worked in the round either on long circular needles (minimum 32 inch long). Small/Medium fits a teen or adult with options for a bulkier, close-fitting look or a more relaxed look. Larger sizing is available for those who desire an even looser look and fit. The drop stitches add to the loft of the cowl, helping it to keep the wearer warm and cozy. 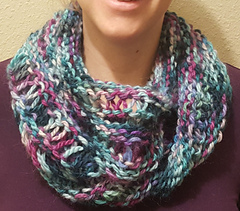 This is a fantastic project for knitters who are just learning to knit in the round and want to add some dimension and interest to their work.